In New Mexico, I picked up Bob, a hitchhiker. He was sui generis, a former Green Beret, and one hell of a headstrong man. I drove 2200 miles in two days, engaged in what was perhaps one of the most bizarre conversations I’ve had in months. Along the way, we were stopped by cops and were searched by a K-9 unit for drugs, on suspician that Bob was a wanted man. On Thursday, I arrived in North Carolina, the final destination, the end of my journey, and the beginning of a new chapter in my life. I cannot possibly write a single post that reflects my thoughts of the journey. There were countless mad adventures that I could not write about on this blog – I will try writing a book about the trip down to the most minute details. Stay tuned and stay hungry, my friends. It seems that car problems are ineluctable. My car broke down this afternoon after the thermostat raged in the red zone and an orange light appeard onboard the dash, screaming for me to stop. After popping the hood, seeing smoke rise like a bonfire, and pouring water down the coolant tube to no avail, I called a tow truck and brought it to a body shop. The engine may have to be rebuilt. I have opted for a rental car to finish the remainder of the trip and am down one full day. Can I make it from Arizona to North Carolina in 55 hours? Serenity. The only tree stump at this location. Solitude is my friend. I have found no other companion that stimulates the creative mind and broadens my horizons. When I’m not out on mad adventures, I retreat to a place by myself and ponder about life. Being free from all worldly engagements is like taking a vacation for the mind – the traffic of life has adulterated the mind and only in solitude can we refreshen it and think anew. 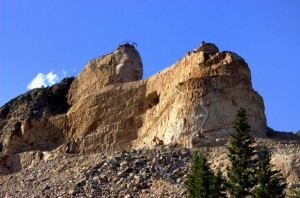 If you’re not from the Mid-West, chances are that you have never heard of the Crazy Horse Memorial. 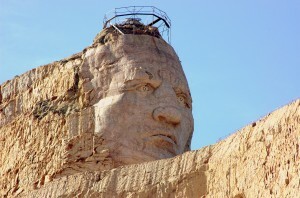 This massive monument is dedicated to Crazy Horse, a doughty warrior of the Oglala Lakota tribe. It is carved from the Thunderhead Mountain, a seventeen mile drive from Mount Rushmore. It is of epic proportions – when finished, it will become the world’s largest statue at 563 feet high and 641 feet long. To put this in perspective, the statue will be taller than the Giza Pyramids and the head of Crazy Horse will encompass an area greater than all of Mount Rushmore. But the truly amazing thing here is not how massive the monument is, but how sculptor Korczak Ziółkowski dedicated 34 years of his life from 1948 to his death in 1982 to this project. In 1947, he moved to South Dakota, built a log cabin at the the present Thunderhead Mountain site, and started blasting away millions of tons of rock. Along the way, he married, fathered ten children, and grew a beard reminiscent of Rip Van Winkle. He endured four spinal operations, heart bypass surgery, and countless broken bones but nonetheless, stayed course and continued working on the memorial. Because he had the foresight to know that it would never be finished within his lifetime, he incorporated his children to help him. Today, Korczak is buried at the base of the mountain and his surviving wife, Ruth Ziolkowski, manages the Crazy Horse Memorial Foundation while seven of his ten children continue working on this project. Korczak had one thing in common with the great movers and shakers in history: dedication. Martin Luther King Jr. and William Wilburforce knew that the causes they campaigned for were bigger than themselves and would continue beyond their lifetimes, so they dedicated their lives to the cause. If you’re not ready to die for what you believe in, you’re wasting your time. In other words, in whatever you do, if you aren’t willing to expend significant time and energy, your attempts will be feckless and your dreams will never be realized. A TV producer I met in New Hampshire told me that he wanted to make a difference, to change the world and impact others. The only way to do this is to dedicate yourself to the cause. Anything less will be a mediocre effort that will yield mediocre results. One of the questions I get asked most often is how I shower and workout. The answer is that I use public facilities. Public pools are perfect for showering. Though not all of them have hot water, they are more than adequate to keep me clean and presentable. 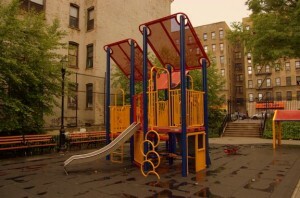 I am often given encomiums on thinking outside the box when people learn that I use public playgrounds to work out. But the truth is, anyone who is forced into a situation will always think of innovative ways of getting by. Instead of paying hundreds of dollars per year for running on a treadmill in a gym, I run in the park. Instead of using weight machines, I use the playground bars to work and sculpt the body. Body weight positioning provide nearly infinite combinations to workout all the muscles of the body. To isolate muscles, I use a sledgehammer. The hammerhead is used as a fulcrum. The further away I grip the handle from the fulcrum, the more torque I have. And because the handle is sufficiently long, it will provide the weight I need for years to come, thus mimicking an entire set of dumbbells. The cost? $12. Our tax dollars pay for public facilities from parks to libraries, so why not take advantage of them? In this economy, you need to cut the non-essentials out of your budget. Start with the basic necessities and innovate. You’ll have extra cash and you’ll be ebullient when you find interesting, lower cost alternatives to your daily routines. Chicago is the birthplace of house, a electronic music genre characterized by funk-infused disco and a synthesized bassline. It transcends boundaries. No one is ostracized because of creed, age, ethnicity, sexual preference, or gender – all people come together as one, united under the same music. This is the epitome of tolerance and self-expression – you can dance as you please, and no one will care or look at you in disbelief. 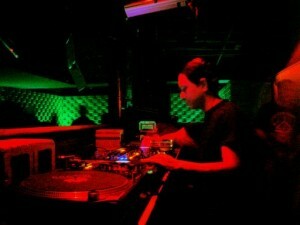 To learn more, I tagged along with a couple of veteran house DJs and producers during the weekend. I had a behind the scenes look at major house clubs, such as Smartbar and Vision. Beats were pounding, people were dancing, and for a moment, the music transcended reality. But house music is more than just an adrenaline pumper. It is also about the underlying quest to search for identity and truth. At an after-party that lasted for 21 hours, a debate ensued about truth. Truth, in essence, is absolute. Everything from good to evil, from ethically comprehensible to morally ambiguous decisions are encompassed by it. Truth is pervasive; it exists regardless of opinion. Any person that wants to deny the existence of gravity is welcome to jump off a bridge and test out the fact of its existence. Everyone strives to know the truth but everyone’s perception of it is different. In less obvious scenarios, can one really determine what is good and bad? In other words, if you feel someone acted unethically, can you tell that person what he did is wrong if he perceives right and wrong differently than you do? For example, one man’s conscience keeps him away from alcohol, but allows him to do mind-altering drugs. To the hidebound thinker, this is a moral travesty but to this drug user, this is permissible, and as long as others are not harmed, it is perfectly fine. Is there a morally correct choice to make in every scenario? There is no easy answer to this dilemma. Many complex issues arise from different perceptions of reality, which can commonly be seen in religion and politics, even amongst those who share the same fundamental beliefs. Uniting people under the same banner with mutual tolerance and respect is the first step for negotiation. Let the house beat go on. Every so often, I must prove to myself that I am still living life and that life isn’t living me. The occasional tough pinch in the skin doesn’t always work. On Sunday, I went cliff jumping at Red Rocks Park, a hidden gem of Burlington, VT. It is accessible a quarter mile off the main trail through dense forests. Standing on the ledge of the cliffs, I could see the jagged rocks underneath the clear water; I was immediately filled with consternation. My heart started pumping. What happened if I hit the bottom and became paralyzed? The possibility of severely injuring myself caused trepidation. But after assurance that the water was deep enough followed by a hortatory countdown from five others I had met, I made the jump and plunged 40 feet into the frigid waters. I had conquered the cliffs, and every fiber in my being had confirmed that I was once again, was alive. Please take a moment and honestly answer the poll. If you answered one month or one year, go out and do whatever makes you feel alive. Help the elderly. Ride a motorcycle and feel the wind ripping through your hair. Watch the sunset from a hill. Dance the night away. Don’t let responsibilities and dogma get in the way of living life. Location I used for pictures. Conventional wisdom states that not having a college education is the end of one’s earning potential. To test the validity of this paradigm, I used a digital camera, a portable printer, a portable battery, and a power inverter to take pictures of people and print photos on location. I was a walking print shop, charging $5 per photo. The results were beyond my expectations. Days before, I scoped out a spot I thought was perfect: The Raging Bull in New York’s Bowling Green Park. It turned out to be a terrible location. I only sold one print. 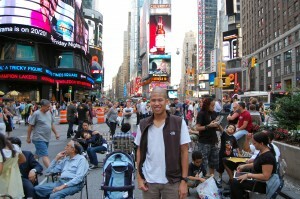 After 45 minutes of trying, I gave up, packed my bags, and went to Times Square. When I arrived, something miraculous happened. My sales skyrocketed 950%. Within 40 minutes, I managed to sell 10 prints worth $50 before my battery died. How much is that in terms of one year’s salary, assuming 40 hour work weeks? $150,000. According to payscale.com, this is on par with the average salary that a doctor of internal medicine makes. I had a slow printer that took over a minute to print a picture. The printer broke down once, costing me five minutes to fix. By the time it was fixed, a potential customer had left. This was my first time. A seasoned professional on the streets would identify potential customers much faster. I only had a hat with paper taped on that stated my intentions. A bigger advertisement would be more effective. Although there is not sufficient evidence to warrant a firm conclusion, I imagine that with faster equipment, more experience, and a better location that I can be making much more. This simple test suggests that some aphorisms may not be true; it is definitely possible to beat the norm. Innovation and timing – two things that aren’t taught in school – are more important to financial success than going through an educational system that may even be hazardous to the mental health. We need to reform our paradigms and ken of education. 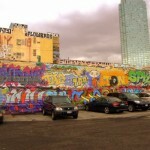 5 Pointz in Queens, NY is the mecca of graffiti. Coruscating murals decorate nearly every square inch of the building. Forget what the travel books say – this is definitely one of the top ten places to visit in NYC. This independently owned building houses around 90 studios independent artists, several clothing factories, and a plethora of food carts. 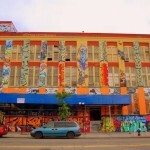 Artists from all over the world converge in this location to legally write on the outer fascade, which is run by graffiti writer and curator, Meres One. On Sunday, I had the opportunity to speak with him about his pet project. 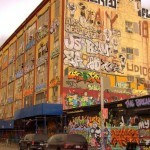 Tell us a little bit about the background of the 5 Pointz. This is our 7th year. We cater to people from all over the world. It is the only legal outlet in New York for people to paint. We’re open Saturdays and Sundays 12-7pm and weekdays by appointment. We get about 1,000 pieces a year and stay open from May or June to October and then we stay open to only foreign traffic, people that come from other countries. The wall usually rotates from a day to a year, depending on the level of artwork and on the level of traffic coming to the building. We can get anywhere from 0 to 60 artists on any given day. It’s free to paint. It’s interesting that you say it is open to the public. It seems like you are turning this into a museum. It’s a lot of work. The landlord doesn’t share the vision, the potential of the art. But there are a lot of positive things. I firmly believe that it will be a museum one day. I just know it… I have that feeling. Right now it is closed because of the staircase collapse. The building is under a lot of construction right now. A lot of rumors have been spread around that there was a woman who fell down the stairs. Yes, she fell down because the stair collapsed. There are a lot of investigations right now. Are those allegations true? She’s an artist and a friend of mine. She fell about 40 feet and is very lucky to be alive and recovering. Whether she sues or not, will be seen in the future. 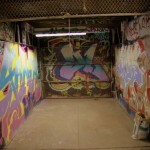 Right now, graffiti seems to be in the pits. You’re trying to rescue it by turning it into a museum. It’s an artform. 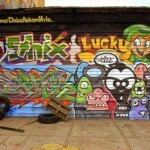 5 Pointz’s existence allows people who really don’t have any familiarity to the artform to be able to see it. Unless you live by a wall that gets done, you really won’t have any exposure to it. 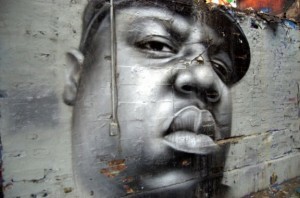 I’m not saying we’re the cure for a graffiti plague, but imagine there was one in every borough. It would keep people busy. Instead of a kid suddenly going “ahh”, he could be going to one of the legal outlets to paint. You think there should be more encouragement of this type of work, especially in places where there are higher crime? I wouldn’t even say higher crime. 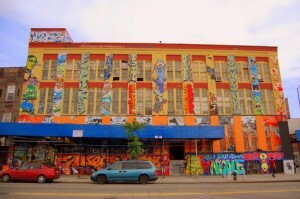 That whole broken window theory where once one window is broken, the whole neighborhood goes down… 5 Pointz is graffiti top to bottom. The neighborhood has a lot less graffiti than other neighborhoods. I would like a lot of my neighbors to have a graffiti-clean environment. I let people know that if you want to paint the walls that’s fine, but you can’t go writing in the neighborhoods around it. For the most part, everyone obeys the rules. Respect. All kids should have access to be able to paint these walls. It allows you to persevere your artistic abilities. 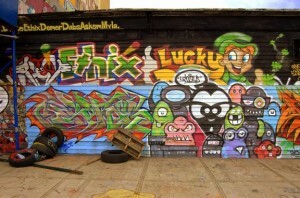 Before I came to this place, when it was Fun Factory and not 5 Pointz, I was able to do my name and that was it. Now, with a building like this, it pushed my craft. I can do a whole background with a scene. It’s good exposure. It can help artists get work. Sure. So how does someone actually get to paint on the wall? They just come down, show an example of their work, and then they paint. If they come from out of town, they usually email me first, at which time, I tell them what they have to do. If they come on weekdays, they have to make an appointment. Whether you never painted at all or you are a professional, you still get a wall space. You seem to be rescuing graffiti from the ground up. But some people say that assigning graffiti defeats the entire purpose of it. 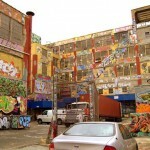 5 Pointz is aerosol art, the use of a spraycan to produce artwork. 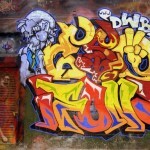 It’s related to street tagging, but it’s not the same. 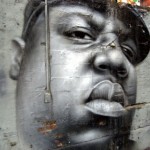 You could do a piece illegally, and it would be considered vandalism, or you could do a piece legally, and it would be considered aerosol art. The only thing is, doing it legally, you’re not getting the adrenaline rush of doing it illegally. The idea is a different type of adrenaline rush for pushing yourself, and taking it to another level. I’m not saying it’s for everybody. If people like to do vandalism, then go do vandalism. If people like to have a place where they dont’ have to look their shoulder to create a mural and enjoy themselves, then come to 5 Pointz. Now it’s interesting you say that. Earlier you were mentioning that you wanted a cleaner neighborhood that didn’t support vandalism. No, out of respect for our neighbors that don’t want it, I try to keep the surrounding businesses clean. I do ask writers not to write in the neighborhood out of respect. We have our walls, we have our buildings. Don’t crap what you eat. 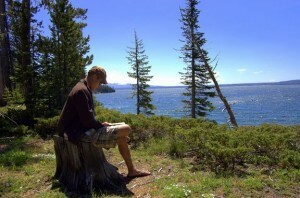 Don’t destroy the surrounding area when you have a place to write. And the businesses… I try to keep clean… like 2,3,4 blocks away, I ask them not to do it. So now that people have attached a face to your tag, Meres One, do people regard you differently when they actually see you and know that you’re a curator, you know, Oooh, there’s Meres One, careful! The bottom line is this: regardless of who I am or what I am, I’m just a regular person, just another artist. I try to show everyone equal respect that I want them to show me, and that’s it. I mean, some people look up to me as a role model. Some people don’t appreciate what I do. I don’t expect everyone to love me, but respect me for what I do and I’ll respect you for what you do. Awesome. When do you expect the museum to be up and running? It’s going to take a couple of years. The good thing is that I have a PR rep. She’s a hard worker. I just linked up with a grant writing company that presented us with a contract and a package deal. I have to have that looked over by a lawyer, and hopefully, we can move forward from there. I don’t want to be too commercialized but yet, it has to be somewhat in a sense commercialized. I want it to maintain its authenticity. I know a lot of people that see dollar signs… I’m definitely not in it for the dollars. It’s an art form, and it’s recognized a lot more all over the world than in New York, which is a shame, considering that it was kind of raised in New York. Sure. Let’s end on that. Actually now, we got our website up. We’re going to have a documentary and a book, as well as quick moving DVD. Those are just some of the projects in the works. The high stuff on the buildings is going to have to all be redone because the repairs are pretty much destroying a lot of the murals. There’s a lot of work ahead of us. It’s 3:23 a.m. and I’m sitting at a Chinese restaurant across from Chad Stevens, the most intelligent man I have come across on my journey. From behind my teacup, I can clearly see his curly hair, soft brown eyes, tall sturdy nose, and million dollar smile showcasing his two day stubble underneath the fluorescent lights. I met this stranger only seven hours ago, but already, he feels like an old friend. Chad is an affable and soft spoken man, and has a way of putting others at ease – the type of friend that you would want to introduce to your parents. The restaurant is getting louder, but instead of speaking up, he politely maintains his voice and leans inward. Chad is the modern day Renaissance man – he is intelligent and handsome, well-spoken and generous to others, a sagacious scholar of current events, and educated in a plethora of different subjects. With his level of intelligence, you’d imagine Chad as a college professor or as a D.C. lawyer. Instead, Chad is unemployed and homeless. When I met him in Bethesda, MD, he was trying to sell me a couple of paintings and a collection of National Geographic magazines. Such stories are not too uncommon. Rewind the clock two days. It’s 9:19 p.m., and I’m walking down 7th street in Washington D.C. after finishing research at the National Archives. To my left, lays a beggar, asking for change. “Nickel, dime, or penny,” he says, while rattling a change cup. I pass right by, and then after a few steps, decide to turn around. I sit down next to him, and start up a conversation. His name is Glen Lewis, a homeless and unemployed 56-year-old. His weathered skin, graying hair, and missing teeth are evidence of a life of hardship. Surprisingly, he is well-traveled, primarily from living a nomadic lifestyle for extended periods of time, at one point, living out of his car for four years. Although Glen never graduated college because of a lack of funds, he is better educated than most other homeless I have met during my journey, and speaks out on many subjects from government to culture and society. But he speaks out about his current predicament above all else. Because of his age and his circumstances, he cannot land a job. “Every time I try to get a job, I can’t get one. You need a reference to get a job. I don’t have insurance, and don’t have a permanent address,” he says. According to the U.S. Census Bureau in 2005, nearly one out of every five people D.C. residents – or 104,000 – lived at or below the poverty line. Glen and Chad aren’t alone in their struggle. A study done by the Metropolitan Washington Council of Governments in 2006 shows that their story is reminiscent of the plight shared by nearly 2,000 of the chronic homeless in the nation’s capitol. In the stronghold of the most powerful and influential country in the world, one has to ponder how the government can turn a blind eye to such a vast amount of people. Hope for systematic change – change that was promised from the advent of the Obama administration, seems to be fading in the background. Until people are willing to actively talk and discuss the issue and venerate the lost as human beings and not animals, it will forever plague our generation and those to come. For now, Chad and Glen must do their best to get by another day.